A properly functioning refrigerator offers us a convenience that most of us take for granted, so when there’s a problem, it needs to be taken care of quickly. For immediate service at the first sign of trouble, call All Time Services. 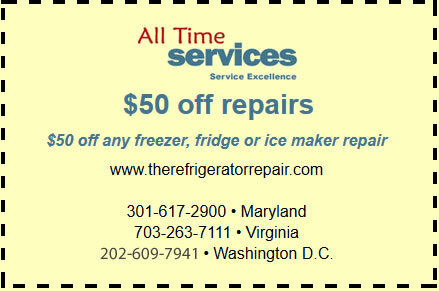 For years, we’ve repaired and replaced faulty and failing refrigerators and their components in homes all over the greater Washington D.C. area. If your fridge needs professional attention, call us today. Regardless of the problem you think is occurring in your fridge, call us immediately for a repair consultation. The bigger a problem becomes, the more expensive the repair will be, eventually getting to the point where it makes more sense to replace your old refrigerator. You may not notice that there is a problem at first, but when your refrigerator needs repair, it won’t take long before the clanking, off cycling, or lack of even cooling becomes apparent. If any of the functional components or the internal parts of your fridge or freezer stop working, you need an expert there right away. 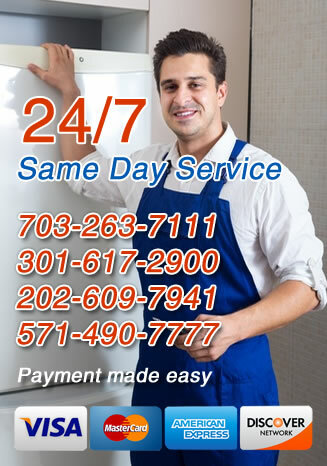 For professional refrigerator repair services in Arlington, VA, Gaithersburg, MD and the surrounding areas, call All Time Services. 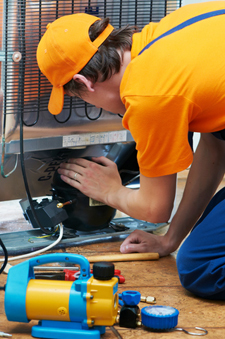 Our technicians are expertly trained to identify and solve all types of refrigerator problems. Whether you’re only mildly concerned about the way your fridge is performing or you’re in desperate need of emergency repair service call us today. Freezer burn is what happens when the food gets dehydrated in the freezer. This happens when the food is not properly wrapped up and sealed. Because the freezer is designed to remove moisture from the environment, freezer burn is actually supposed to happen. The only time it is a problem is if the defrost cycles are frequent and food is regularly warming up too much, a sign that you may need to have the compressor or thermostat inspected.